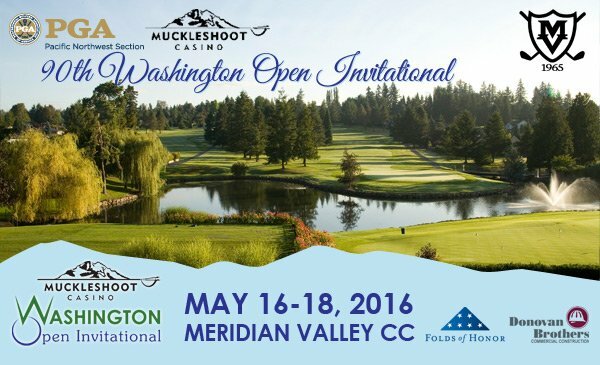 The Muckleshoot Casino Washington Open Invitational is under way at Meridian Valley CC in Kent, WA. We have a strong field of PGA Professionals and amateurs all vying for the title of the Muckleshoot Casino Washington Open Champion. The Washington Open Invitational is a 54-hole stroke play individual competition. The 2016 Muckleshoot Casino Washington Open Pro-Am benefits the Folds of Honor. Folds of Honor provides scholarships for the children and spouses of those killed or disabled in service to the United States Military. For more information, go to https://www.foldsofhonor.org This year’s event will be a Pro-Am as part of the 2016 Muckleshoot Casino Washington Open Invitational held at Meridian Valley Country Club in Kent, WA. This will be Meridian Valley CC’s tenth time hosting the Washington Open Invitational – hosting in 1972, 1976, 2002, 2004, 2005, 2009, 2013, 2014 and 2015. They also hosted the SAFECO Classic from 1982 through 1999. MVCC has grown into one of the Northwest’s most respected golf courses to the credit of the founding members who successfully achieved their goal to develop a first-class golf club. Results will be posted at regular intervals throughout the day at https://2016SECmuckleshootwa.golfgenius.com “Almost live scoring” will begin at 10:00 am each morning after the groups begin turning. Be looking to see if one of your friends posts a low score!